In class yesterday, we started to experiment with different aspects of charging an object such as charging by contact, charging by induction, and polarization. As Tesla mentioned in his summary of the history of electrical discoveries, things took off at a rapid pace after Gilbert published his work. As we saw in class, we can transfer charge from one object to another with friction/rubbing. And of course, the more rubbing, the more charge. This idea is simulated in the following Phet simulation. It didn’t take John Travoltage to figure this out. The more rubbing the more charge, so they built machines to do the rubbing for them. Otto von Guericke made one of the first such generators in 1663 out of a ball of sulfur. It is interesting the Otto was also one of the pioneers of the vacuum pumps and played a role in the entire debate of atoms and the void. But what you may notice with the simulation is that as the charges go onto John Travoltage, they spread out. Charges are anti-social, they don’t like each other and repel each other. And when too many build up, and they find a nice place to jump to (such as the ground) we get sparks! 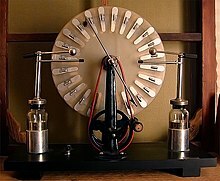 In class, we will make bigger sparks and play with a modern (developed in 1880) version of the electrostatic generator called the Wimshurst Machine. However, the Wimhurst machine is not a friction generator, but an influence machine. It actually uses electrostatic induction to charge the two Leyden Jars. You can read about charging by induction here where there is a nice simulation of the experiment we did in class with induction. Speaking of the Leyden Jar, this is a storage device for charge. It was developed in 1745 by Pieter van Musschenbroek at the Univ of Leyden. A device such as this uses two conductors separated by an insulator. One version is a glass jar with metal foil on both sides of the glass. You can also put metal foil on the outside and fill the inside with water. Such as device was called a “condenser” through most of the 19th and early 20th centuries, although today it is called a capacitor. This Friday, Dr. Horn will visit class and talk about Ben Franklin. Take notes! Junior year you will study Franklin in depth and his role in the founding of our country. For now, you can become familiar with his contributions to electricity. The amazing thing is that in 1752 Franklin actually captured lightening (using that key) and stored it in a Leyden Jar thus proving the connection between charges in the sky and charges generated in the lab. The other major contribution from Franklin is that he challenged the idea from DuFay that there were two types of electricity, resinous (negative and made by rubbing resin), and vitreous (positive and made by rubbing glass). Franklin thought there there was only one kind of charge, and objects either had an excess or deficit of charge, which made them positive of negative. He wasn’t sure which object, glass or resin, actually produced the charge. He had a even-money bet, and he bet on glass (positive) producing the charge. Today, all of our electrical engineering diagrams are based on Franklin’s convention. However, 150 years later with the discovery of the electron, physicists proved Franklin wrong, and that electricity is composed of negative charge (from resin) and not vitreous charge as Franklin thought. But if you want a lot of charge, you need a Van de Graaff generator. The Van de Graaff is a friction machine. You have probably seen the one at the Boston Museum of Science. We we play with a much smaller version. where q is the quantity of charge on objects 1 and 2, and d is the distance between those objects and k is Coulomb’s constant. The Coulomb force has many similarities to Newton’s Universal Law of Gravitation. Both the gravitational force and the electric force act at a distance, and the magnitude of the force depends inversely of the square of distance, an inverse square law. However, the electric force can be either repulsive or attractive, whereas the gravitational force is only attractive. Additionally, looking at the relative constants, you can see that the gravitational force is relatively week compared to the strength of the electric force. We will discuss the vector nature of the electric force another day. On a recent exam, you calculated the gravitational force between an electron and a proton. 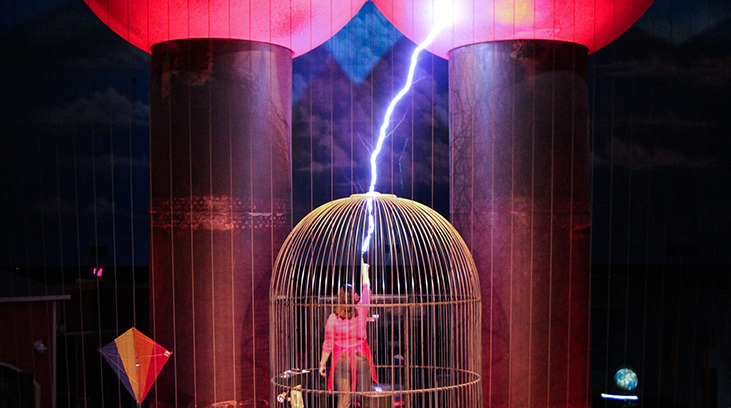 We can now do the same for the electric force. Given that the strength of each charge is 1.6 10-19 Coulombs, and if we use the Bohr Radius for distance, what is the magnitude of the force? So plugging in for charge, distance, and the Coulomb constant……. F = 0.92 10-7 Newtons. Next up: the differences between insulators and conductors.